The common black-and-blue mark linked with any bruise is very evident when it surrounds the eye. The dark-purplish circle, commonly called a black eye, is an internal bleeding injury and will last a little more than a week. The colour you see is caused by tiny blood vessels under the skin breaking and bleeding. As the injury heals, the body absorbs the blood. During healing, the bruised area will turn green and then yellow. The bruised area may move down the side of the face. When a fist causes a black eye, the damage is likely limited and will heal with a little self-care. When something harder causes the black eye — a bat, for example — you should be concerned about a more serious injury. 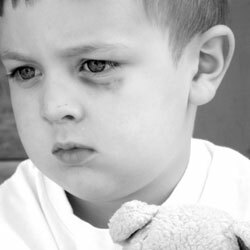 Sometimes, a black eye can signal a skull fracture, a broken facial bone, or a serious eye injury. These problems require medical attention right away. An eye injury that is not treated by a doctor can lead to glaucoma or impaired vision. What are the common symptoms of a black eye? Relieve any discomfort with acetaminophen, such as Tylenol. Apply ice to the eye as soon as possible after the injury occurs. Use ice for 10 minutes every hour to reduce swelling and limit bruising. Avoid placing ice directly on the eye. Wrap a bag of ice cubes or an ice pack in a towel before using. Wear sunglasses in bright areas to avoid eyestrain.